Kazuo Okada is a Japanese billionaire with a net worth of $1.5 billion. He was formerly Steve Wynn's partner in the Macau division of Wynn Resorts. Now, he has a new plan. He wants to transform the Philippines into the next Hawaii. Okada believes that the country's beautiful beaches and balmy weather are ideal for becoming the next major leisure and entertainment destination. The Japanese gaming mogul believes that the country can become a major money-making tourist destination marketed to Asian travelers. Of course, Okada has reason to hope that this is the case. He is the chairman of Universal Entertainment Corp., which started out as a slot machine maker and has branched out into a casino operator with a massive development on the banks of Manila Bay in a district known as Entertainment City. Kazuo Okada was born in Japan in 1942, three years before the end World War II. His father died at a young age, so Okada dropped out of high school to help his mother. He went to a vocational school for engineering and found he had a knack for mechanics. He started a business repairing TVs, jukeboxes and other devices, but soon became bored with that and wanted to manufacture something. He then began making coin-operated arcade games. That was a failure. While he was good at fixing things, making products required more precision. Customers began returning his arcade games and debt mounted. Things changed for Okada after his first trip to Las Vegas. The wealth on display there felt like the American Dream to Okada. He bought one of the oldest slot machines he could find, took it apart to study it, and then copied it – with a twist. Okada designed a computer program for slot machines that allowed players to win but also to have misses that were so close to winning that it would lead them to keep putting coins in the machine. Okada's slot machines made their way to Las Vegas in 1983 and by the late 1980s, Okada's company controlled 75% of the slot machine market in Nevada. And then Okada's American Dream came crashing down around him. The Nevada gaming authorities ordered him to remove the near miss feature in his slot machine's software. They felt that that feature misled players. Okada's company had to reprogram 15,000 slot machines. Despite the troubles in Nevada, Okada's Universal Group was expanding rapidly at home. He manufactured and supplied the machines for Japan's booming pachinko industry. Along the way, Okada was introduced to Las Vegas casino tycoon Steve Wynn. The two became friends in 2000, after Wynn lost control of Mirage Resorts in a hostile takeover by Kirk Kerkorian's MGM Grand. Okada invested $380 million in Wynn's new company, Wynn Resorts, over a two-year period. He was given a 20% stake in the company. 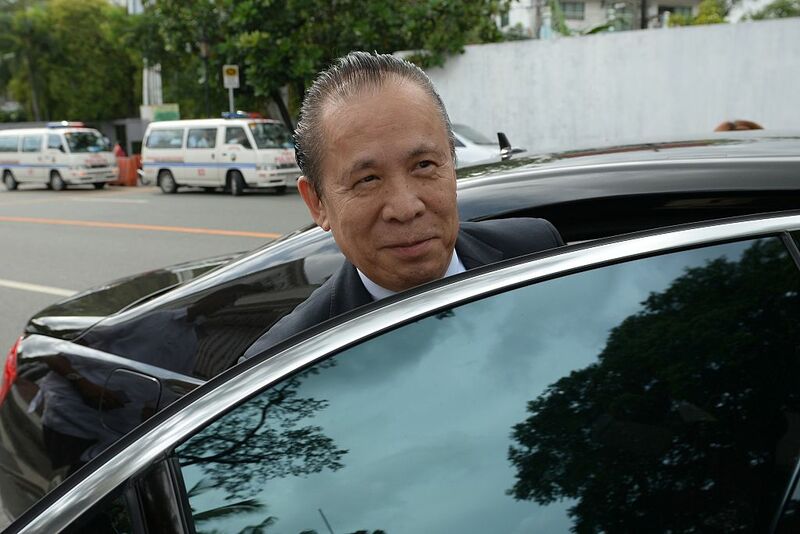 All was well between Wynn and Okada until 2008, when he made his initial investment in Entertainment City and revealed his plans to build a casino in Manila. Wynn wanted no part of that development and in 2012, Wynn Resorts filed a lawsuit accusing Okada of trying to lure Chinese gamblers away from Wynn's casino in Macau with his casino in Manila. Wynn Resorts also accused Okada of bribing gaming officials in the Philippines. Okada was removed from the board of Wynn Resorts and forced to sell his 20% stake at a 30% discount. Okada is still fighting to get back some of the lost value of his shares in court in Clark County, Nevada. Nonetheless, Okada moved on with Okada Manila, his huge waterfront hotel and casino. The development includes four casino resorts with hotels, shopping centers, Michelin-class restaurants, and a theme park. The development is one of the largest casino complexes in the world with 1,000 hotel rooms, 3,000 slot machines, and 500 gaming tables. It takes up one third of the 49-acre Entertainment City. It is such an impressive development that it has drawn Australian billionaire James Packer and American actor Robert DeNiro as investors. The $2.4 billion development opened in December 2016. Okada hopes to draw high rolling gamblers from China, where casinos have been suffering from a crackdown in corruption by Chinese authorities. Okada is taking a big gamble that a city which has suffered under decades of poverty and corruption is ready to reinvent itself into a luxury tourism destination to rival Hawaii. Only time will tell if he will succeed. Three months ago, 74-year-old billionaire Kazuo Okada was forcibly removed from the board at Universal. Now, he is plotting a way to get control of his company back.